Sounds dirty, doesn’t it? 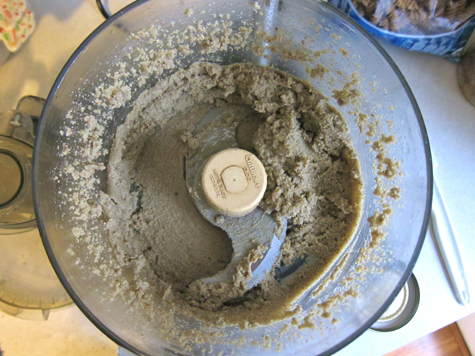 And honestly, the way I made tongue-love to my food processor afterwards, it practically was! Truth: you know you’re a foodie when you’ve mastered the art of licking the ‘S blade’ clean without cutting your tongue. This is another one that’s so easy, cost-effective, and delicious that I can’t believe it’s not standard practice. Why isn’t everybody doing this?? Maybe because, like me, they assumed you need a high-speed blender. You don’t! All you need is your trusty food processor. 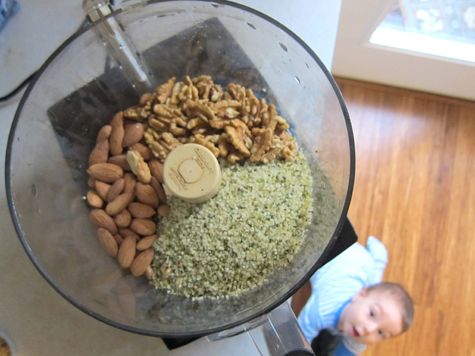 Load up the food processor with 3 cups worth of nuts/seeds. Here I used 1 cup raw almonds, 1 cup raw walnuts, and 1 cup hemp hearts. You can make mono-butter as well, but multi allows for a greater range of nutrients. Plus, you get to be creative and it always tastes different! You can use anything, but I imagine that pecans, macadamias, cashews, sunflower seeds, and pumpkin seeds would be especially wonderful. Turn that sucker on and LEAVE it on! Other recipes around the internet will call for adding extra liquid -oils, water, sweeteners, or nut milks. But you don’t need to do this! All you need is to be patient and let the food processor keep running (stopping every so often to scrape down the sides). Your nut butter will go through a series of phases (‘crumbly’, ‘sticky’, etc) but after 5-10 minutes the oils will release and the whole thing will relax into a rich, creamy, silky smooth deliciousness. Those bananas don’t stand a chance. 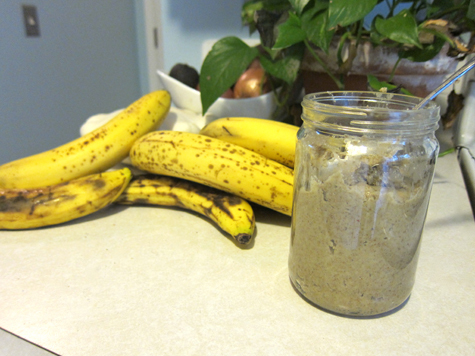 Transfer to a jar and store in the fridge. Go MoFo! I have nuts & a processor…can’t wait to try it! Yes! Another one of those things that seem so simple and so daunting at the same time. 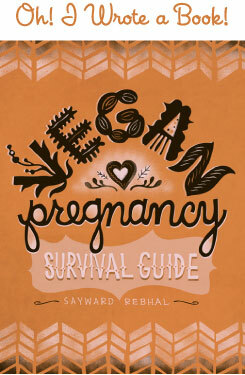 There are *so many* veg-curious people participating in MoFo this year, and I’m loving all of the How To/So Simple recipes that are flooding the blogosphere! And zomg the look on Waits’ face is adorable. I don’t have a food processor where I live now, but as soon as I do I will be sure to make this. Thanks for showing how easy it is! I started doing this a few weeks ago, so yum! BTW, I got my beautiful calendar in the mail the other day–BONZAI! Awesome! Now that’s what I’m talkin’ ’bout!!! YUUUM!!! I’m also enjoying glimpses of Waits in your pics too!! So many comments I wish I could just “like” Facebook style. Oh man, I’m such a FB junkie. lol!! I’ve tried hazelnut butter, but I added all sorts of oils and other stuff the recipe told me to. For some reason it wasn’t too tasty. I’m gonna try that one! No soaking needed? Hee hee, I’m glad you guys enjoy Waits in the backgrounds. I thought it was pretty cute but obviously, I’m biased! @ Rea – YAY! So glad you like it and it reached you safely!!! @ Minna – Soaking would be healthier for sure, but for the recipe it’s not necessary. I’ll soak next time but this one was inspired by a serious craving that needed to be fulfilled NOW, haha. It’s like Where’s Waldo (Where’s Waits?). Give it up–that’s a stunt baby! I’m with Fanny on this one… A food processor is probably the last “I really want/sorta need” machine missing on my kitchen. Every other machine I’m missing is not that versatile, but I still want one, and I’m looking at you sushi-maker 3000 (ok, it’s real name is Suzumo SVR-NNX and here is a video of how it works. http://j.mp/d39wv2). But I digress. @Sayward: Can this be done with a regular blender? or is the food processor a must? Okay, correction, store it in the fridge if it make it to the fridge. Also, speaking of bananas, you know if you freeze them and then blend them in the food processor, you get the look of ice cream and the consistency of soft serve? It’s magic, I swear. Heehee! I was thinking “Where’s Waits?” right before Rebecca posted that! Too adorable he is! Dude. I’ve been doing forever, I do equal parts peanuts and walnuts (I love peanut butter and peanuts and walnuts are cheap at my wholesaler) and I add handfuls/what I see fit off any of the following: pumpkin seeds, zucchini seeds, linseed/flaxseed, sesame seeds, sunflower seeds, hazelnuts, macadamia nuts [boyfriends parents have a farm!!!! (Except, the shells are SO hard you hard – as with all macadamias - you need a brick and/or hammer, haha Australian plant life – open only to fire or brute force!)] ETC ETCS. This goes for: handfuls of peanuts, pumpkin seeds, sunflower seeds and a sprinkling of sunflower seeds, but adjust accordingly. But seriously, whatever! Bolivians cook and dry out Lima beans until they’re like little crispy chips… you could use them!!! Anyways, put the spice mix in and heat (with no oil) for a few mins until it smoke. Add the tiniest bit of oil and the nuts/seeds. Toss constantly until each is golden brown…. TADA!!!!!!! Vegan, healthy ‘popcorn’. It’s so ‘munchy’ and addictive! Ooooh interesting, I’ll have to try as I just gave up on marge’s, the only vegan ones where own by the biggest meat producer in the EU or were stock chocka full o palm oil. @ Annie – That roasty toasty recipe sounds sooo good! @ Squiggle – For somethIng like this I just wash out an old mason jar – it stores in the fridge and gets eaten fast enough so I’m not worried about it. For ferments I’ll wash extra careful with extra hot water. For home canning I always boil to sterilize, and use new lids/rings. But the real taste sensation was, as you suggested, pairing it with bananas. I am bracing myself for nutritional deficiencies, as I have resolved to only eat these two things for the rest of my natural life.